With the 530i M Sport, BMW India adds more bells and whistles to the petrol 5 Series. BMW has added a new variant to the 5 Series range in India. It’s called the 530i M Sport, and as the name suggests, it gets some racy design updates, giving it a more aggressive look. The 530i M Sport has been priced at Rs 59.20 lakh (ex-showroom). Interestingly, the arrival of the 530i M Sport also means that BMW India has discontinued the 530i Sport Line variant. Coming to the highlights, the 530i M Sport gets some standout visual bits such as gloss black finish on the kidney grille slats, larger air intakes, a side skirt trim and a diffusor-style rear apron, finished in metallic ‘Dark Shadow’. Apart from that, there’re 18-inch M-themed alloy-wheels and tail-pipes finished in high-gloss chrome. Of course, it also gets ‘M’ badges on the fenders. This variant also comes with M Sport brakes along with blue callipers with M logo. Inside, you’ll find more M-inspired bits to make things even sportier. There’s M leather steering wheel, illuminated door sills with M logo, leather sport seats and so on. The 530i M Sport also gets BMW Display Key with remote control parking function, wireless smartphone charging, parking assistance, surround view cameras and more. The powertrain is unchanged from the 530i Sport Line, which means at work here is a 2.0-litre inline four-cylinder, turbo petrol that churns out 248bhp and 350Nm of torque. The engine is BS-VI approved. Power transmission duties are carried out by an 8-speed automatic, sending the drive to the rear wheels. The 530i M Sport can dismiss 0 – 100km/h in 6.2 seconds. 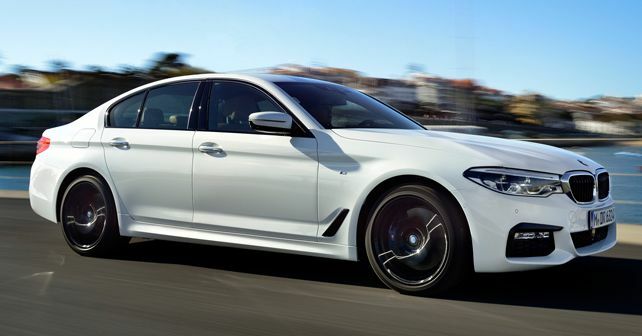 Like other 5 Series variants, the BMW 530i M Sport is also assembled locally in India. The 530i M makes a strong case for a daily M driver, offering a fine balance between performance and practicality. That said, the diesel 530d M Sport is also on sale in the country, and we think it also offers a pretty impressive combination of both.